Intelligent textiles and clothing – a part of our intelligent ambience; Methods and models for intelligent garment design. Part 1 Phase change material: Introduction to phase change materials; Intelligent textiles with PCMs; The use of phase change materials in outdoor clothing. Part 2 Shape memory materials: Introduction to shape memory materials; Temperature sensitive shape memory polymers for smart textile applications; Development of shape memory alloy fabrics for composite structures; Study of shape memory polymer films for breathable textiles; Engineering textile and clothing aesthetics using shape changing materials. Part 3 Chromic and conductive materials: Introduction to chromic materials; Solar textiles, production and distribution of electricity coming from solar radiation; Introduction to conductive materials; Formation of electrical circuits in textile structures; Stability enhancement of polypyrrole coated textiles; Electrical, morphological and electromechanical properties of conductive polymers fibres (yarns); Multipurpose textile based sensors; Textile micro system technology. Part 4 Applications: Wear care – usability of intelligent materials in work wear; Intelligent textiles for medical and monitoring applications; Context aware textiles for wearable health assistants; Intelligent garments in pre-hospital emergency care; Intelligent textiles for children; Wearable biofeedback systems; Applications for woven electrical fabrics. The use of intelligent textiles in clothing is an exciting new field with wide-ranging applications. Intelligent textiles and clothing summarises some of the main types of intelligent textiles and their uses. Part one of the book reviews phase change materials (PCM), their role in such areas as thermal regulation and ways they can be integrated into outdoor and other types of clothing. The second part of the book discusses shape memory materials (SMM) and their applications in medical textiles, clothing and composite materials. Part three deals with chromic (colour change) and conductive materials and their use in such areas as sensors within clothing. The final part of the book looks at current and potential applications, including work wear and medical applications. 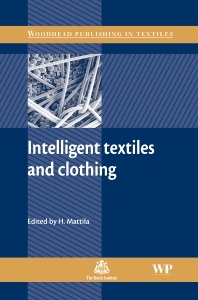 With its distinguished editor and international team of contributors, Intelligent textiles and clothing is an essential guide for textile manufacturers in such areas as specialist clothing (for example, protective, sports and outdoor clothing) as well as medical textiles. Dr Heikki Mattila is Professor of Textile and Clothing Technology at Tampere University of Technology, Finland.